It’s that time of the year again, across the globe gamers have been queuing through the night to get their hands on the latest edition of EA Sports now world-famous FIFA game. To celebrate the franchises latest release, FIFA 19, we’ve put together a very special marketing blog. For those of you who are unfamiliar with the famous football title, *where have you been hiding*, one of the most popular modes in the game is FIFA Ultimate Team (FUT) – a game which pits gamers against each other to, you guessed it, build the ultimate team. It’s not just about player ratings, however, equally fundamental to success on the pitch is building a squad with great chemistry. Much like building an all-conquering squad in FIFA 19, building the perfect marketing team requires you to not only pick the best players (marketing experts) but also ensure those different members work together perfectly. It’s with this in mind that in our latest blog post, we explain why we believe can provide a game-changing and winning combination. In marketing, just like football, to achieve success you require an effective “game plan” and a manager to deliver it. That’s why we assign named individuals dedicated to working on specific accounts. 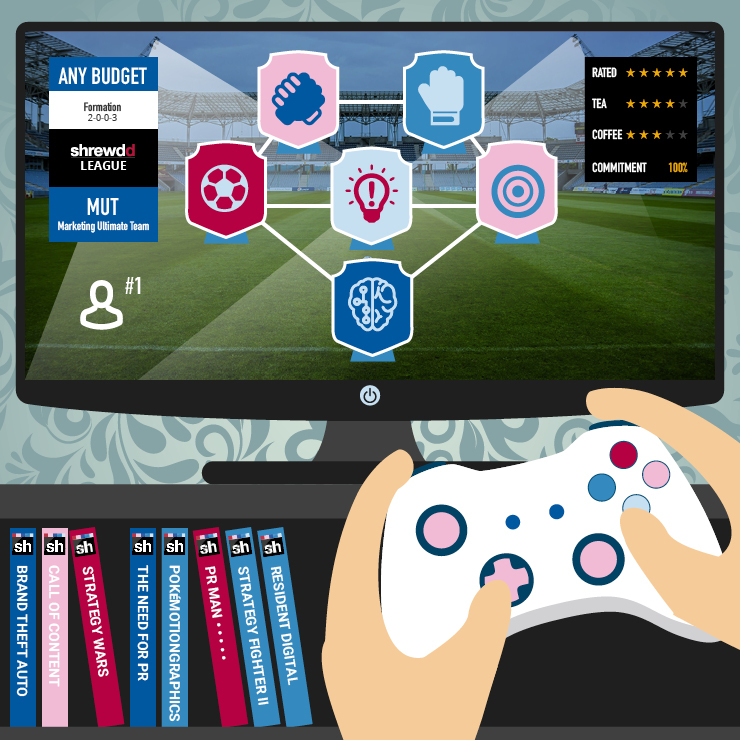 This member of our team is tasked with picking the team, formation, tactics and, of course, making in-game changes should the marketing strategy not be delivering the results you desire. Every marketing team needs a ‘midfield maestro’, a creative team member who is capable of coming up with original ideas that can turn a B2B marketing campaign from drab to fab. We pride ourselves on creating visually engaging content, whether that is an eye-catching advertising campaign or a suite of stimulating GIFs, animations and videos that bring your brand to life. When it comes to putting together a marketing team for your campaign, we ensure our campaign teams include a midfield linchpin, or content manager – a member of the team directly tasked with creating exciting, original and ultimately impactful content from social media posts to whitepapers, blog posts, case studies, emails and much more to engage with your target audiences. The content marketing manager is responsible for creating the ‘scoring opportunities’ that can ultimately be converted into leads and sales. Much like any football team, every marketing team needs a ‘target man’, someone who is adept at efficiently analysing all forms of data, from Google Analytics to social media metrics and everything in between, and aligning it to pre-determined ‘targets’ or Key Performance Indicators (KPIs) to demonstrate how effectively the marketing strategy is working. All our campaigns are underpinned with careful measurement and analysis, giving you complete visibility of your marketing performance throughout the entire campaign. All successful football teams require a reliable goal scorer. This is the player that grabs all of the headlines, in marketing terms, this is your PR manager! The PR manager’s scoring exploits make sure we gain favourable press coverage for your business, ensuring you reach your intended audiences and get your story told. The world’s best football teams are built on a solid defensive foundation. Not often renowned for their pace or flair, the role of the defender is to consistently break up the opposition’s attacks and makes it hard for your competition to come in and disrupt your strategy. The defender in your marketing team is often your Search Engine Optimisation (SEO) expert, a marketer responsible for planning and implementing all complex SEO strategies, from organic and paid traffic campaigns to pay-per-click (PPC) marketing – all of which are crucial to ensuring your website, and ultimately brand, gets the exposure it deserves online. Since Shrewdd Marketing was established in 2003, we have built a team of knowledgeable marketing professionals covering all of our areas of expertise – advertising, brand, content, digital, motion, PR, social and strategy – to ensure that our marketing campaigns not only unlock your strategic plans but also deliver a return on investment. Get in touch today to see what we can offer your business.